Today we’re talking fitness and nutrition. I’ve tried to use apps and websites like SparkPeople and MyFitnessPal but never have too much luck keeping up with it. I’m a pen and paper girl. 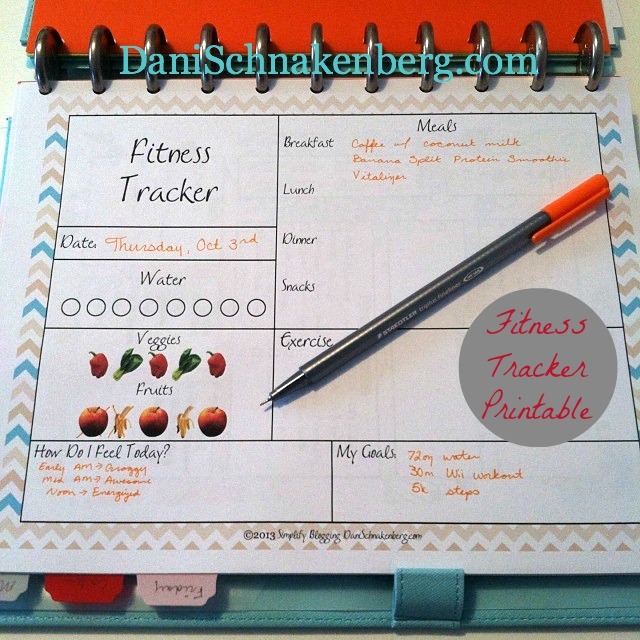 So now I’m using this fitness and nutrition tracker printable. At the end of the week, I enter all the info I have written down in my Shaklee 180 App and I get the best of both worlds. Now that my tracking fits my style better, I’m on par with my health goals! WooHoo! This is a bit of a plain version of the tracker, but you’ll soon be able to find a bright, happy, rainbow version over at Erin Branscom’s Simple Health Swaps page. A little birdie told me there might even be tear off notepads for sale in the near future. I love this Fitness Tracker but I wanted to know if there is a weekly version. I don’t have a home printer and it may costly to print 365 pages. If not I still love the tracker and may just print a few weeks at a time. Glad you like it! At this time, I do not have this available in weekly format. In November, I will have it available in tear off notepads, though!